We offer different types of sweetie favours which are a great idea for Wedding's and party's as they are great and unusual gift for your guests! Our most popular item is out personalised sweet bags which start from only 79p each, with a wide choice of fillings. We can personalise the sweet bags with an photograph or message. For your Wedding we can design our sweet bags with your chosen colour scheme and font to coordinatewith your theme to make a great favour. We also hire out our Sweetie Push Pop Stand which holds up to 100 containers. We can also attach personalised stickers to match your occasion. 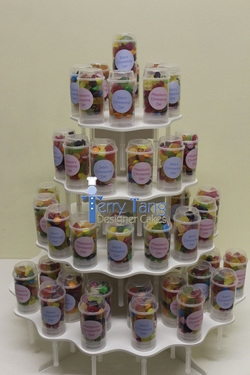 We have our very own unique Pick 'n' Mix stand that we hire our for your special occasion, which comes with large tubs of 16 different sweets and your own personalised header. Please call into the shop for our full range of sweet favours and more information.